At Mighty House Construction we believe that you don’t need need radical change to make a radical shift in how you live, play, and grow in your home. Sustainable makeovers are about small, sticky changes that you can sink your teeth into and make a big difference. Watch as Mighty House’s Co-Founder, Laura Elfline, presents at the Green Building Slam on this Spanish Bungalow in Madrona. What started as a simple kitchen remodel became a project that would enable a family to increase the livability of their home, enhance their energy conservation efforts, and balance the circle of life. Then, check-out more pictures from the project in our gallery. You would hope that keeping our homes free of bacteria and dirt would be simple. But it turns out that there can be a surprising number of toxins in the products that we use to keep our homes clean! The EPA has just made it easier than ever to choose products in the store that are free from harmful chemicals. This rating also takes into account a product’s impact on the environment in terms of packaging waste, water use, and more! Remodeled Homes Tour Oct 8-9! Join us! We will be showcasing our North Beach Artist Lofts on both Saturday and Sunday during the Master Builders Association’s 2016 Remodeled Homes Tour. 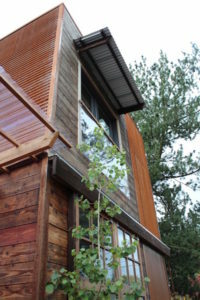 These homeowners decided they needed an on-site studio after having their first child and wanted to find a sustainable solution that would have minimal impact on the property. Save Water and See the Salmon! When you work to conserve water at home, not only are you saving money on your bill, but you are also keeping water in our rivers for the salmon. This is especially important during the summer and fall, when our fish friends start their annual migration home. Want to bring your family to witness the salmon returning to spawn this fall? Visit the King County website to find out where! As our business continued to grow over the past year, we began to find it more challenging to keep up with the detail-intensive processes of home remodeling projects. Since client satisfaction and quality are our top priorities, we decided to implement Co-Construct to help us better manage projects. This software lets us keep track of schedules, budgets, subcontractors, and change orders. And it lets our clients see everything all in one place. You can watch a full video demo of their software here.